Mercury is a significant environmental problem in Maine. To help address this concern, Maine law requires businesses and consumers to recycle all mercury-added light bulbs (a.k.a. “lamps”). When one of these bulbs breaks, mercury is released. Mercury-added lamps include compact fluorescent (CFL), linear fluorescent (straight, circline and u-tubes), neon lights, black lights, UV lights, and high intensity discharge (HID) bulbs. 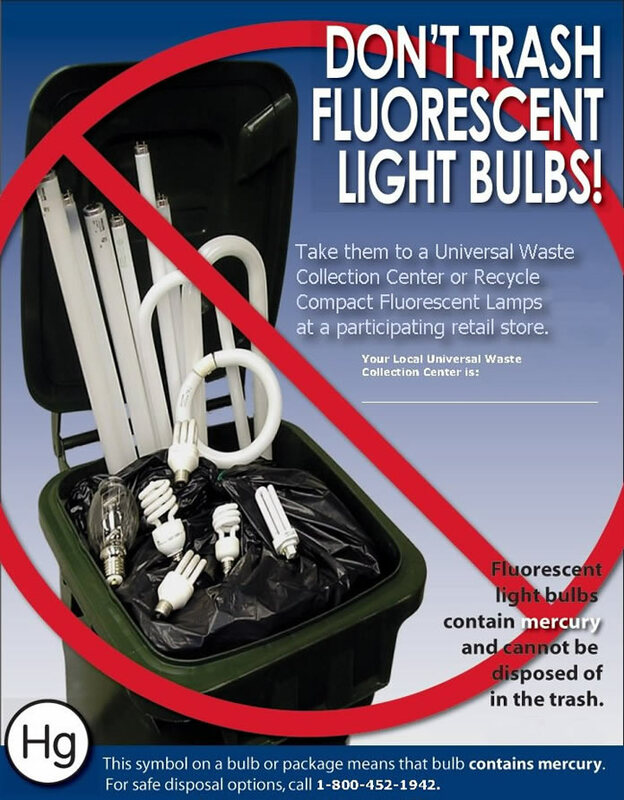 In Maine, it is illegal to throw mercury-added bulbs in the trash. Since you can't throw them away, what should you do with burnt out bulbs? Answer: Recycle them. Help ME Recycle is our map-based guide to help find locations near you where you can take your burnt out fluorescent and HID bulbs for recycling. Households can recycle intact HIDs, CFLs, circuline, U-shaped and straight tube bulbs up to 2 feet at any of more than 100 participating retail stores (PDF) for free. You can also recycle HIDs, CFLs and other fluorescent bulbs where your municipality has made lamp recycling arrangements (PDF). Some municipalities allow both households and businesses to use the municipality's mercury-added lamp recycling site. 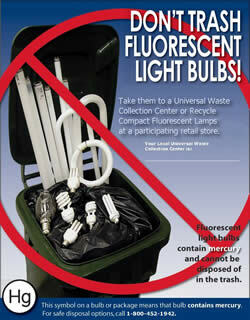 Businesses should check the listing to see if their municipality will take their bulbs. Businesses may use a Universal Waste Management and Recycling Company (PDF), contract with a lamp replacement company to get their fluorescent bulbs recycled. Businesses may contact DEP Hazardous Waste program staff at (207) 287-7688 about requirements and options for businesses. Maine requires manufacturers of mercury-added lamps to implement a product stewardship program for the recycling of these bulbs from households. The manufacturers' program provides containers to municipal waste collection sites and to retailers for storage, shipping and recycling of the bulbs. For more information on recycling lamps from businesses and on the fluorescent lamp study contact Kevin Jenssen at (207) 299-4877. For more information about product stewardship and the manufacturers' program contact Megan Pryor at (207) 314-3357.